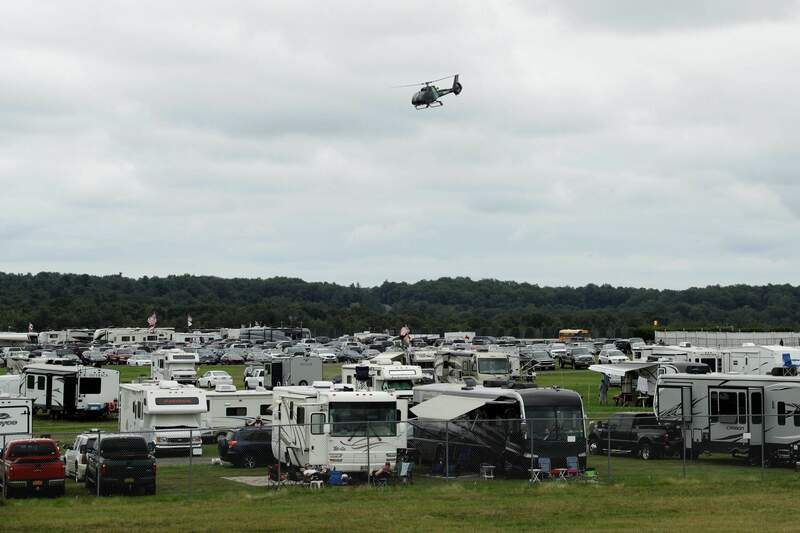 A medical helicopter takes off from the infield during the IndyCar auto race at Pocono Raceway, Sunday, in Long Pond, Pa.
ALLENTOWN, Pa. – IndyCar driver Robert Wickens will have surgery for a spinal injury suffered in a crash at Pocono Raceway. Wickens was airlifted from the race track following a crash in the opening laps of Sunday’s race. IndyCar said he suffered injuries to his lower extremities, right arm and spine, and a pulmonary contusion. Wickens’ car sailed into the fence at Pocono when he and Ryan Hunter-Reay made slight contact. Hunter-Reay’s car spun and Wickens’ car launched over it and into the fence. A large hole was torn into the fence and the race was delayed two hours to repair the damage. Wickens is a rookie in IndyCar but a championship driver in touring cars in Europe. He left that series this year to try IndyCar alongside childhood friend James Hinchcliffe. The two Canadians became friends racing against each other in the junior ranks and Hinchcliffe lured Wickens back to North America. Hinchcliffe and Wickens drive for Schmidt-Peterson Motorsports, and Wickens had been surprisingly competitive since his series debut. He was on his way to winning the season opener at St. Petersburg, Florida, until he was spun in the closing laps. Wickens has one pole, four podiums, a pair of runner-up finishes and was sixth in the standings before his crash.